As we mentioned last month, a private investigator does a lot more than spy on spouses while wearing a trench coat and fedora. At Cape Fear Investigative Services, we provide a wide array of services to private individuals, but we are also often hired by businesses who need a number of tasks done for them. Many people don’t realize that businesses have special needs that a private investigator can help them with. Here are some of the services we provide to businesses. Corporate Background Checks – We make sure the person you’re considering hiring isn’t hiding anything that might harm your company. Criminal Cases – Employee theft can have a huge effect on your business. We can get the proof you need to find out who’s stealing from you. Employment Verification – There are several reasons you might need to verify someone’s employment status. We can fid out for you if a person works where they claim they do. Fraud – Are you an insurance or mortgage company and suspect that someone might be lying for monetary gain? Or maybe you have an employee who is faking injury to claim workers comp. Either way, we can get the evidence you need to stop the fraud. 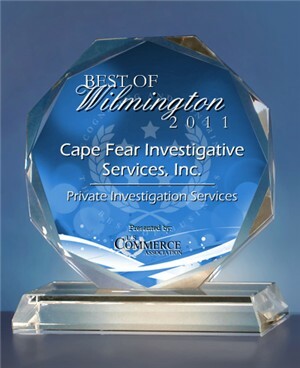 If you represent or are in charge of a business that can use any of these business investigative services, give Cape Fear Investigative Services a call at (910) 762-4374 to get peace of mind, because peace of mind is priceless. This entry was posted on Tuesday, January 28th, 2014 at 2:31 pm	and is filed under Investigation Services. You can follow any responses to this entry through the RSS 2.0 feed. You can skip to the end and leave a response. Pinging is currently not allowed.